A dog silhouette guards the sidewalks around CEBAF Center on the Jefferson Lab campus. 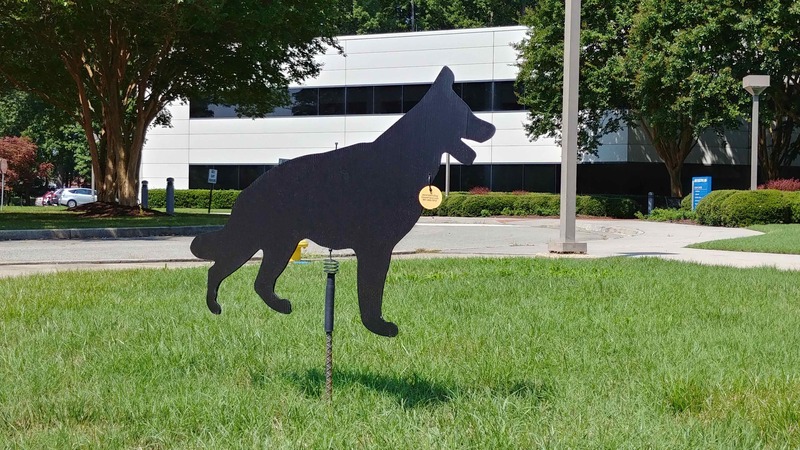 Spring-actuated dog silhouettes placed strategically around campus successfully deter geese, saving Jefferson Lab time, effort and money. For nine years, Facilities Operations and Maintenance Manager, Bob Sperlazza, has been making sure Jefferson Lab’s buildings and their utilities are in functioning, efficient and reliable conditions. “Our mission in Facilities Management and Logistics is to provide the lab with highly efficient and reliable infrastructure for science operations and its people,” Sperlazza said. On a daily basis, Sperlazza’s phone rings with various requests involving building structures, material handling equipment, heating and air-conditioning, fire protection, electrical systems, water, roofing, carpeting, plumbing, landscaping or painting. “You’re trying to satisfy everyone’s needs on a limited budget,” Sperlazza said, when describing the complex system of managing people, buildings and processes. He credits his own talents for building and managing to his childhood years, when he worked alongside his father fixing up rentals in a family-owned apartment building. One thing that he never expected, however, was to be responsible for implementing a solution that consists of deploying spring-actuated dog silhouettes. When Sperlazza first arrived at Jefferson Lab in 2009, he noticed a tremendous amount of geese on campus. With the presence of geese, comes the responsibility of managing their waste and their particularly aggressive behaviors, especially during breeding and nesting seasons. On a search to solve the problem, Sperlazza was sent a link to a company that provided environmentally friendly, non-lethal geese management solutions: Spring-actuated dog silhouettes. Sperlazza ordered five of them from Watch Dog Goose Patrol, a company based out of Roseville, Minnesota. The silhouettes were placed into the ground around CEBAF Center and the Experimental Equipment Lab buildings. “I was skeptical,” he said, recalling the first time the black, corrugated-plastic, weather-resistant dog cutouts were stuck into the ground. Remarkably, the silhouettes worked, successfully deterring geese from collecting in those high-traffic areas! After witnessing their effectiveness, Sperlazza ordered four more, bringing the total to nine dog silhouettes deployed at the lab. He said the springs bring the dog-shaped cutouts to life. “In heavy wind, it looks like the dogs are running,” Sperlazza explained. The stick attached to the spring allows for easy re-location of the dogs, an important and necessary action to ensure the highly adaptable geese don’t lose their fear of the silhouettes, diminishing their effectiveness. The landscaping team moves them every week after the grass is cut. The dogs do remain, however, in the high-trafficked geese areas. While there are many ways to solve geese nuisance problems (noisemaking devices, visual deterrents/barriers, motorized vehicles, trained dogs, chemical repellents and habitat modification, to name a few), the dog silhouettes were a low-cost, animal-friendly choice. The geese stay away from the dog silhouettes, leaving a waste-free, walkable campus. The silhouettes cost $50 each, but they save Jefferson Lab from having to devote employee time to clean up the inevitable mess that an active goose population leaves behind. “We strive to continually find good cost-effective, environmentally-prudent ways to satisfy the needs of the lab population,” Sperlazza said.